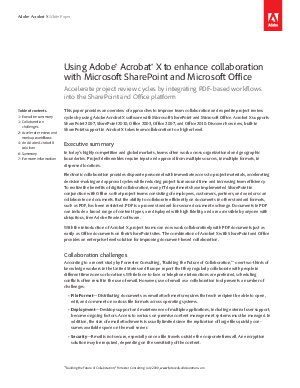 This paper provides an overview of approaches to improve team collaboration and expedite project review cycles by using Adobe Acrobat X software with Microsoft SharePoint and Microsoft Office. Acrobat X supports SharePoint 2007, SharePoint 2010, Office 2003, Office 2007, and Office 2010. Discover how new, built-in SharePoint support in Acrobat X takes team collaboration to a higher level.